I recently upgraded from an original iPad Mini to an iPad Mini 3, and I decided that I should make a case for it because it will surely accompany me to QuiltCon in February! My first thought was to look for one of Annie's patterns, and I hit the jackpot. 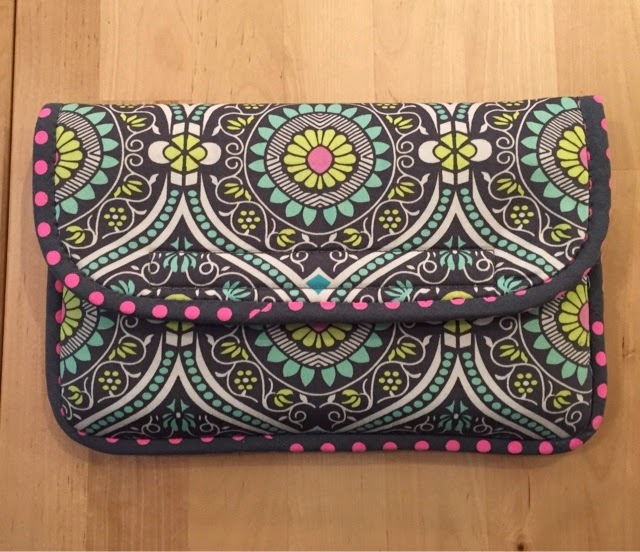 The iCases pattern from Patterns by Annie is primarily designed for both sizes of iPad, but it could be easily adjusted for other size devices. Measurements are included for both the regular size iPad and the smaller iPad Mini. The fabric requirements for the small bag included 1 fat quarter for your main print and a half yard of fabric for the lining and binding. In addition, you will also need a zipper, Velcro, Soft and Stable, and Pellon SF101. Not too tight and not too loose! With my pieces now at the revised size, I followed the pattern. This pattern is very easy to follow and does not have a lot of steps which usually means it will be a pretty quick project to finish, and it was. 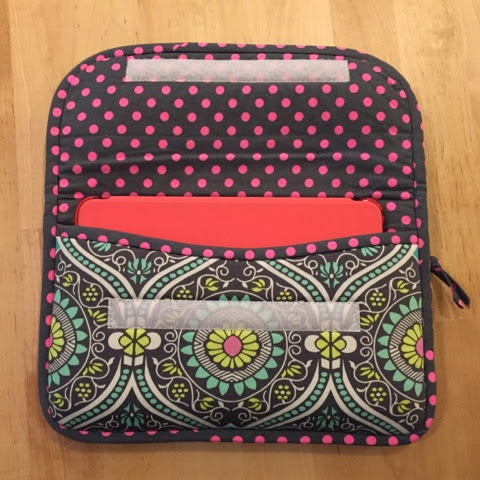 I love that this pattern has a Velcro closure on the front flap which does not interfere with the magnets in my iPad. Another plus is the zipper pocket on the back of the case. 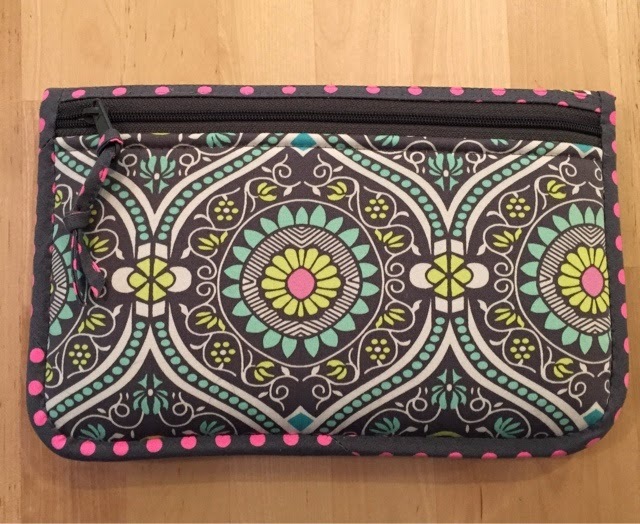 This will be an excellent pocket to keep an extra pair of earbuds and a syncing cable. I love how padded the case feels with the iPad inside. It feels secure and well-protected. I can't really say that there was anything I really dislike about the pattern, but as with most things I did make some additional changes (besides resizing the pieces). I had the case all sewn and bound, but I really didn't like the accent fabric on the front flap. That piece of fabric covers the stitching like from attaching one of the velcro strips, but it was far more distracting than the stitching would be for me, so I pulled off part of my binding and removed the offending piece. As soon as I took it off, I was so much happier with it. If you choose to make this same choice before starting the pattern, you can skip the Pellon SF101 because it's only used on that one piece. The second change was one of my regular modifications. I opted to hand finish my binding. Obviously, I had a little bit of binding fail because I didn't do a fussy cut bias binding (I didn't even think about it if I'm being honest), but I obviously should have taken that into consideration. I feel like the iCases pattern would be suitable for an adventurous beginner. Sewing through the thickness of multiple layers of Soft & Stable was probable the most challenging part for me, but it was worth it. I love my case!